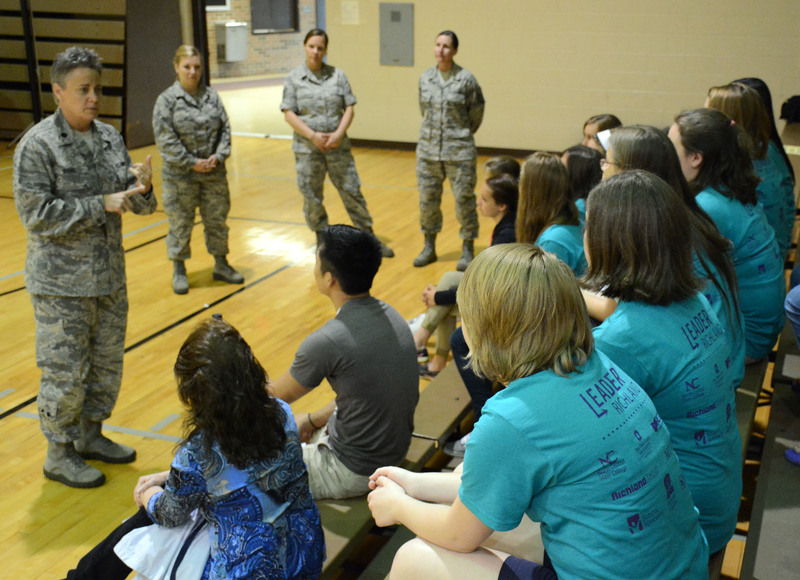 Members of the 179th Airlift Wing talk to LeaderRichland students about career options. More than 1,300 middle school boys from 13 area schools visited the campus of The Ohio State University at Mansfield and North Central State College over five days in May to learn more about careers, higher education and their community. The event, titled LeaderRichland, is coordinated by the colleges and the Richland County Development Group. Originally created by County Commissioner Marilyn John, then mayor of Shelby, for 7th and 8th grade girls in Shelby, the event began with just one school and 175 students. The goal of LeaderRichland is to show middle school students that a higher education is attainable, John says. In its fourth year, the event alternates between hosting boys and girls. The event was sponsored by Richland Bank, United Way of Richland County, and Cleveland Financial Services. About 25 county leaders participated in the discussion cohorts. Ashley Benson, director of TRIO Student Support Services, will be a returning speaker for LeaderRichland this year. This will be Benson’s second year speaking at LeaderRichland. Her topic is bullying. John says LeaderRichland is a great way to showcase higher education and the collaboration between the schools and the colleges. We are at the close of another school year and this one especially has been an exciting one. It is also a bittersweet end to the year as we say farewell to my two leadership partners in the Dean’s suite. Associate Dean David Tovey, who has held the position for more than six years, returns to his first love – teaching music on the Mansfield campus. Terri Fisher will retire after 33 years of service at Ohio State Mansfield, including three years as assistant dean, and move to the Chattanooga, Tenn. area where she plans to stay active in the academic arena. Dave Tovey greeted me to campus when I was named dean and stood by my side throughout first year, ensuring a seamless transition. 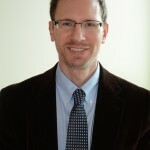 He has been instrumental in overseeing the conversion from quarters to semesters (a project that spanned nearly three years), as well as having been instrumental in bringing new degree programs and classes to the campus, including Sociology and undergraduate Social Work, as well the establishment of licensure for Education majors. Talks with the College of Engineering the first year he was assistant dean resulted in our campus offering a first-year Engineering program. Dave also has been closely supervising plans for a second year Engineering program alongside efforts to increase online courses and opportunities for students to study abroad. Terri Fisher also was there to greet me as the new dean in her capacity as Faculty President, agreeing to continue her term in order to provide a sense of leadership stability. Because of her efforts, research activities have exponentially increased. She expanded the scope of undergraduate research on our campus and incorporated an understanding of the benefits of undergraduate research into our campus culture. As well, Terri helped to develop a novel approach to retention in which a staff member is the intake person for academic concerns about students. She also was instrumental in applying the principles of Complete College America initiative for the four-year degree programs offered on our campus in order to enhance student success and increase graduation rates. I thank both Dave and Terri for their selfless service to Ohio State Mansfield and wish them well! 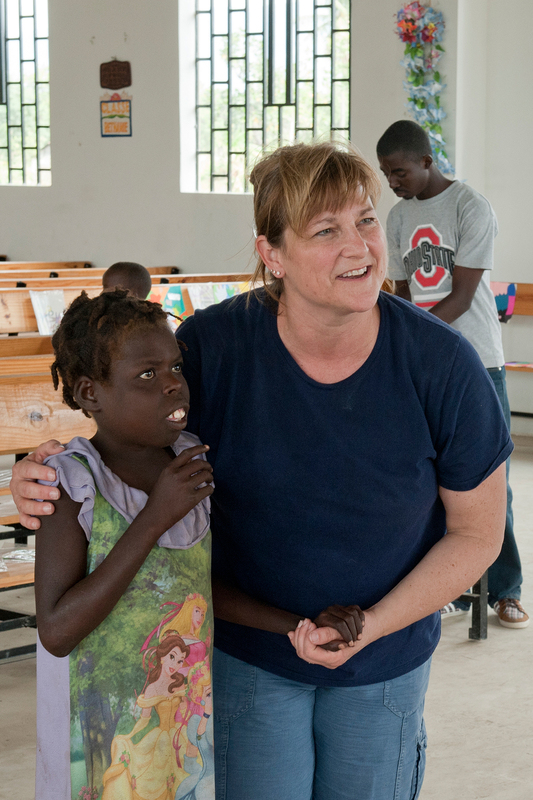 Dr. Terri Bucci, Ohio State Mansfield Education professor, works in a classroom during one of her trips to Haiti. 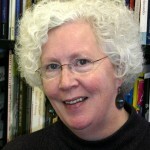 She received the Distinguished International Engagement Award from Ohio State. Ohio State Mansfield Professor Terri Bucci paired a national award for technology and teacher education with the vision of a member at a local church who wanted to build an orphanage and school in Haiti; the result quickly grew into the Haiti Empowerment Project. Ten years later, the project includes a study abroad experience for Ohio State students of all majors, as well as partnerships with universities in Haiti. The project recently was awarded the university’s Distinguished International Engagement Award and was nominated for the national C. Peter Magrath Community Engagement Scholarship Award. The project involves bringing together the intellectual and material resources of Ohio State and other U.S. faculty, undergraduate, and graduate students to collaborate with the Haitian community to aid its growth. Bucci learned much about Haitian government and education from her initial visit, but what she didn’t expect was the response when she returned. It continued to grow from there. Bucci began to find graduate students or faculty who specialized in the fields the Haitians were interested in. However, the project isn’t about telling the Haitians what to do. It’s about helping them grow. Because the native languages are Haitian Creole and French, translators are needed so that the project members can work with rural as well as urban Haitian communities and coordinate future plans. Bucci has been going to Haiti a few times a year since 2005. The project became a study abroad program a few years ago, which opened it up to student involvement. While most universities avoid planning travel to a country with a travel warning, Ohio State is unique in that it allows students to go to Haiti. Of the award, Bucci said she is just happy the project is getting more notice. Some new but familiar faces will take up residence in the Dean’s suite in July as Professors Norman Jones and Susan Delagrange take on the positions of associate dean and assistant dean respectively at The Ohio State University at Mansfield. 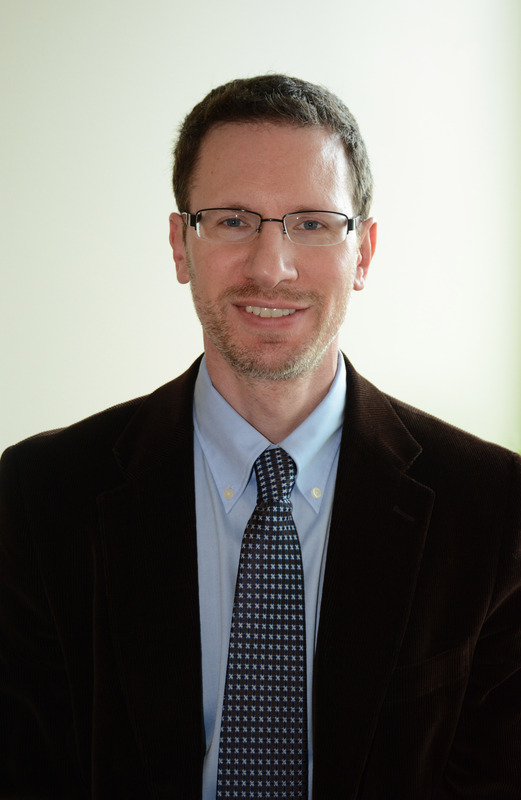 Jones is currently an associate professor and program coordinator for the English department and Delagrange also is an associate professor of English, and until recently served as Director of Instructional Design. Their predecessors, David Tovey and Terri Fisher, are stepping down from the positions as of June 30. Tovey will return to teaching musical education while Fisher plans to retire. Among Jones’ duties will be working with program coordinators to develop semester class schedules, exploring new degree programs that could be offered at Ohio State Mansfield, developing articulation agreements with other colleges, and helping with faculty hiring and the annual review process for faculty. He hopes to continue improving Ohio State Mansfield’s relationship with the local community and providing students a wider range of academic opportunities. “We want to try to meet the needs of the local community and our students better by adding some new programming,” Jones said. Delagrange will continue to teach part-time while she supervises the staff of the Conard Learning Center and the Bromfield Library and Information Commons. She will also lead research efforts at the campus by publicizing student research opportunities and achievements and increasing community awareness of faculty research. Jones received his undergraduate degree in the Humanities at Yale University and his doctorate at The University of California while Delagrange received her bachelor’s degree from the University of Akron before earning her doctorate at The Ohio State University. Students at Ohio State Mansfield are saying No More to domestic violence and sexual assault by forming a new chapter at the campus. The campus chapter is the first of its kind in the state. 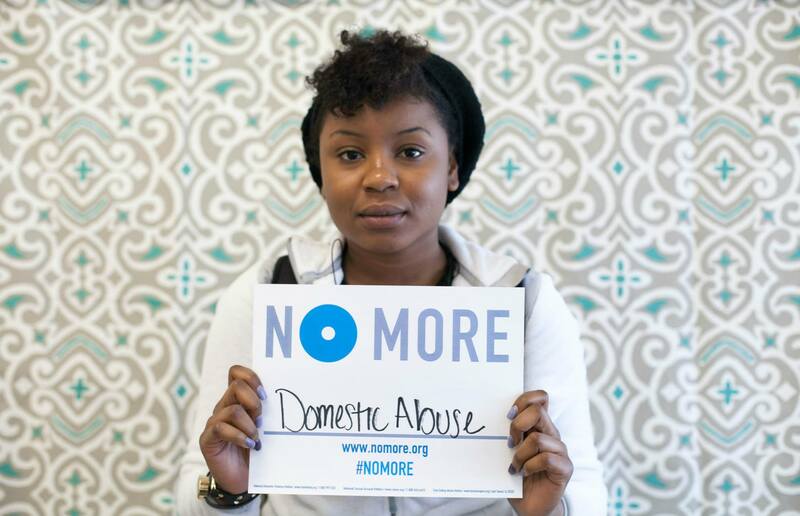 Launched in March 2013 by a coalition of advocacy groups, the U.S. Department of Justice and others, No More is supported by thousands who want to increase visibility for domestic violence and sexual assault. Kathy Ezawa, director for the Domestic Violence Shelter, which serves Richland and Huron counties, broached Diversity and Family Engagement Director Renee Thompson with the idea to start a chapter at the campus. “I’m excited to be partnering with Ohio State Mansfield and students who have such a vision for compassion and leadership in our community,” Ezawa said. Graduate Social Work student Ashley Foust, who interns for the Diversity program, set plans in motion. In collaboration with the College of Social Work Student Association, the fledgling chapter organized two events – a photo booth where students, faculty and staff could photograph their response to No More, and the official chapter launch with talks from a domestic violence victim and a county prosecutor. “It was a huge collaboration and it happened unexpectedly,” said Quinn Johnston, a member of the social work club. 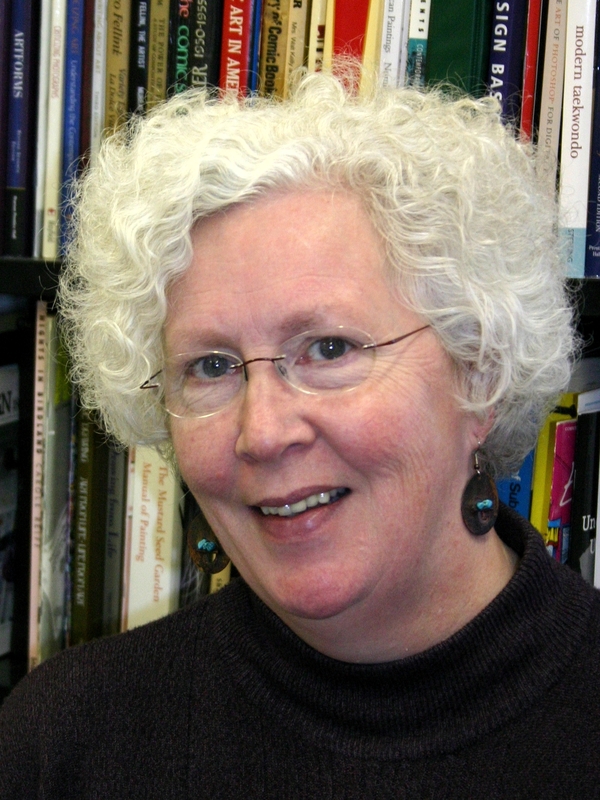 Johnston found herself in an abusive relationship on the Columbus campus in 2006. She says she didn’t have the support system to keep her on track, so she stopped going to classes and eventually was dismissed from the university. The chapter already is planning activities in conjunction with Welcome Week and orientation in the fall. Foust hopes the group can bring more awareness and a voice to the issue. “Just speaking up can stop a lot of the behaviors and cause people to think about their actions,” Foust said. Happy May! Spring Semester 2015 is winding to a close, and so this will be my last biweekly report until Fall Semester 2015. We have witnessed a tremendous amount of forward progress these past nine months, and have much to look forward to during the 2015-2016 academic year. Here’s a quick look at some of the issues impacting us at the moment. We are currently in the midst of two searches in Admissions: one to replace Shari as Director and one to replace the Admissions Counselor position vacated by Kelly (and Collin previously). In the meantime, we are placing a great deal of responsibility on Natasha’s shoulders to carry the work of the Admissions department forward. Many thanks to her and everyone else who is pitching in to help carry the load! I hope you remembered to RSVP for our Fifth Annual Day of Celebration events taking place on Friday May 8th. We will be experimenting with our first off-campus lunch and awards ceremony this year, as well as enjoying the tried and true hospitality of Dawn Kitchen and Jim Nicholson for the evening festivities. On Monday May 11th, the first workshop recommended by the Campus Culture Committee will take place, with a focus on civility, trust, and dealing with change. Once again, I would strongly encourage everyone to attend. From my vantage point, this is an opportunity to strengthen our entire campus through active participation of all faculty and staff members, which is why I will be in attendance for all three sessions that day. Renovation activity is scheduled to begin in Eisenhower in the very near future. By the time that faculty and students return to campus this fall, there will be plenty of evidence that a remarkable transformation will have taken place in our dining facilities. How exciting! In closing, I wish to express the hope that faculty members will have a productive summer, and will rejoin the rest of us this coming August with a reinvigorated sense of mission and purpose. Go Bucks and Go Ohio State Mansfield!